Associated to the prominent and long-established auction house Christie's, Christie's International Real Estate was founded in 1995. It has today the largest network of real estate agents specialized in the luxury property market. The network comprises more than 138 real estate companies and nearly 40,000 sales associates in more than 46 countries. The Christie's name is synonymous with quality, integrity, credibility and client satisfaction. Only companies which are leaders in their market and reach an overall level of excellence and customer satisfaction and have a proven record of success in the specialty segment of the market in which they operate become exclusive affiliates and obtain the right to use the famous and highly respected Christie's International Real Estate trademark. Through an exclusive process of advertising and marketing and a large database of clients, Christie's International Real Estate provides access to a highly qualified public in search of exclusive properties throughout the world. These properties are advertised in Christie's International Real Estate magazine, published on a quarterly basis; in specially printed personalized foldouts which are distributed throughout its worldwide offices; on Christie's International Real Estate; in Christie's art catalogue and other well known international publications. We are proud to have been chosen an exclusive affiliate of Christie's International Real Estate for the state of Rio de Janeiro. Our clients now have the possibility of purchasing property in any part of the world through any one of our real-estate affiliates. 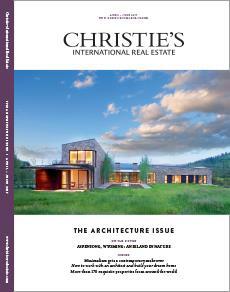 Millions of international readers rely on Christie's International Real Estate magazine for the most exceptional property offerings. The publication-which also contains news about Christie's fine art auction house and the global network of luxury real estate brokerages-is now available online. White Paper: a Vision of the Global Luxury Real Estate Market. Conducted by Christie's International Real Estate, the White Paper - Luxury Defined is an annual analysis report on the trends of the major high standard markets worldwide, providing first-hand insights from their affiliate network, which includes J&A. This eddition offers information about quantitative data, purchasing behavior, impact of foreign exchange in real estate prices, top 10 ranking of the most luxurious cities, and presents as the market has developed in 2018.